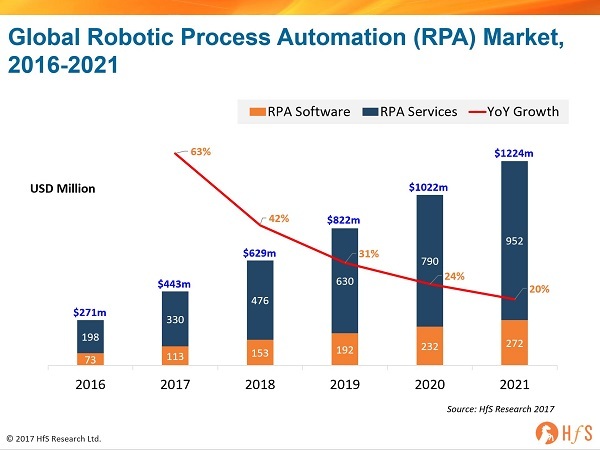 The global market for RPA Software and Services reached $271 million in 2016 and is expected to grow to $1.2 billion by 2021 at a compound annual growth rate of 36%. The direct services market includes implementation and consulting services focused on building RPA capabilities within an organization. It does not include wider operational services like BPO, which may include RPA becoming increasingly embedded in its delivery. RPA describes a software development toolkit that allows non-engineers to quickly create software robots (known commonly as "bots") to automate rules-driven business processes. At the core, an RPA system imitates human interventions that interact with internal IT systems. It is a non-invasive application that requires minimum integration with the existing IT setup; delivering productivity by replacing human effort to complete the task. Any company which has labor-intensive processes, where people are performing high-volume, highly transactional process functions, will boost their capabilities and save money and time with robotic process automation. Similarly, RPA offers enough advantage to companies which operate with very few people or shortage of labor. Both situations offer a welcome opportunity to save on cost as well as streamline the resource allocation by deploying automation. Stay tuned for our broader forecast for the global Intelligent Process Automation market, which is in the final stages of its fine-tuning, as the expenditure enterprises and service providers are making their internal teams to learn how to automate business processes intelligently, the internal training and development, pilot projects and trial implementations, is so much larger than simply software licences and third party professional services to work the software effectively. Digital effectiveness is all about organizations enjoying real-time process flows forged through the elimination of manual process break-points and intelligent linking of data patterns across the front and back offices. 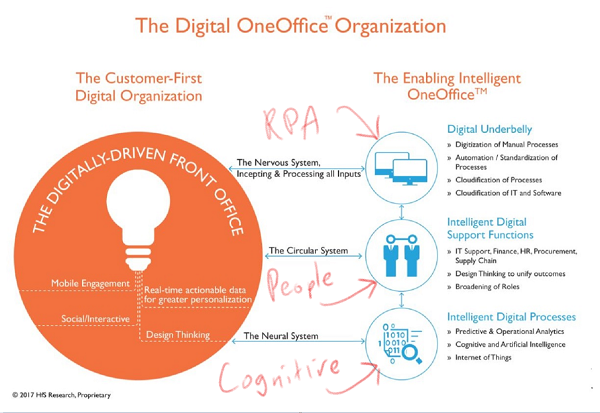 RPA is a critical building block in facilitating this journey, but ultimately it's the whole OneOffice, not the sum of the parts, that matters for true real-time effectiveness. This is about one integrated organization unit, where teams function autonomously across front, middle and back office functions and processes to promote real-time data flows and rapid decision making, based on meeting defined outcomes. In the future... front, middle and back offices will cease to exist, as they will be, simply, OneOffice, and RPA has a critical role to play supporting the building blocks. However, the market is still very young and we're only at the start for so many organizations, so let's not get too carried away until we see really robust solutions with proven ROI and long-term business value. Phil, what are your thoughts on which domain/ industry is leading the charge in RPA market share? YAnd how do you see it evolving over the next few years? And similarly how's IA going to evolve for these industries. Finally, a number I can quote with confidence. Great insight and clarity from the team that's had their finger on the pulse of RPA since the beginning. Thanks Phil and Jamie Snowdon! @Sanyog - see here for industries from our state of outsouring study. Energy, banking, insurance, manufacturing leading RPA adoption interest. Industries where cost shaving is king and offshore outsourcing very mature. Main processes under RPA review are F&A, claims processing, banking specific work... emerging are payroll, recruiting, procurement. The platforms? Blue Prism has the most mature partner ecosystem, but hats off to UIPath for it's investment raising and competitive model. Automation Anywhere has been very active in F&A process and growing fast, but its financial footing is less clear for the future and clients stuggle with central control and governance over these environments. All three products offer strong bot building recording capabilities, and all three have differing pricing and partnering strategies. Redwood is interesting as it focuses on developing bots to fix manual breakages in SAP environments, but it's partnering with the advisor channel less clear. Pega is quietly developing a stella orchestration engine which contains RPA and Workfusion has a freeware version which is being trialed by some firms. Check out the landscape here. In general, RPA software firms are claiming - and demonstrating - some client cases where ~40% of cost (or more, in some cases) is being taken off the bottom line. While some of these cases are genuine, there are many RPA pilots and early-phase implementations in the industry that have been left stranded because clients just couldn't figure out the ROI and how to implement this stuff. This isn't simply a case of buying software and looping broken processes together to remove manual efforts... this requires real buy-in from IT and operations leaders to invest in the technical, organizational change management, and process transformation skills. Did companies become world class at HR overnight because they bought an expensive Workday subscription? Or stellar at sales and marketing because they slammed in a Salesforce suite? So why should they become amazing at cost-driven automation simply because they went and bought some licenses from an RPA vendor promising bot farms and virtual labor forces? RPA and Intelligent Automation have sparked a major war in the worlds of outsourcing and operations, where many battles are being fought - and the winners will be those who are in this for the long haul, who can absorb some short-term pain in order to benefit from the larger spoils further down the road. 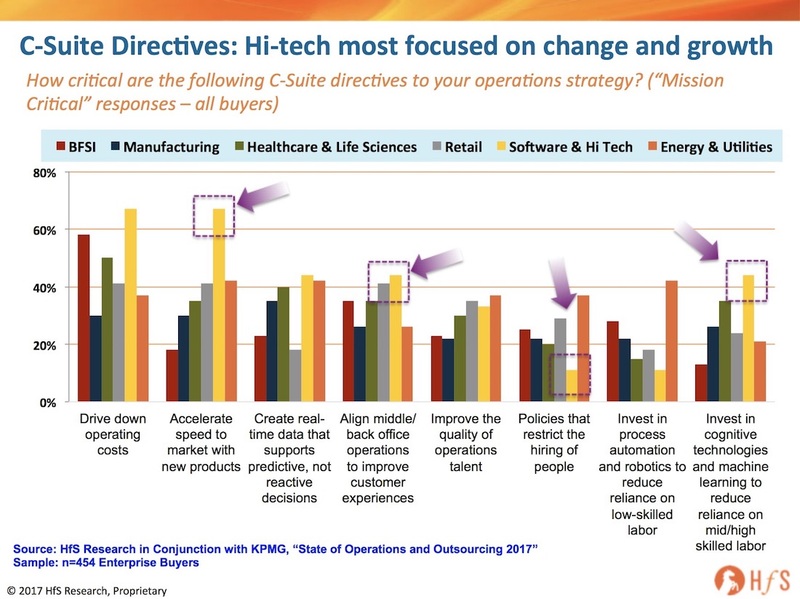 While automation is killing outsourcing today - costing many people their jobs, their reputations and destroying the profitability of legacy engagements, those who can hunker down, focus on self-contained projects where they can fix one broken process at a time, can get stakeholders onside by demonstrating meaningful, impactful outcomes without major resource investments, will be the winners. Start with one process at a time, prove how to fix in, then onto the next, then the next... that is the only true way to be successful in this destructive automation-infested world. Very interesting numbers Phil. Probably the most realistic I have seen so far. The future is challenging & unknown. How much RPA & AI "Mimics an Expert" & the applied learnings will determine the development course/milestones. As the millennials lap these advances as normal, believe me though being in the IT industry for the past 30 years, I am sure it would leave me astounded in the years ahead. As with all discoveries & advances, the option I not about acceptance, but how well we integrate these in our daily life for fulfillment. Cheers to the IT industry. Hi Phil, Do you see the adoption of Bots as a bridge to Gap a Tool's or Applications' capability? i.e. a bot doing an activity where product enhancement is not the best option. Eg: A Bot to do 2/3 way matching whilst processing an Invoice OR a Bot to onboard suppliers based on a manual form outside of the Procurement tool OR Bot to do catalog maintenance, etc.